Scott Pruitt has repeated a particular line again and again since becoming the head of the Environmental Protection Agency. "The future ain't what it used to be at the EPA," he's fond of saying. As it turns out, the past may not be what it once was, either. In an obscure corner of the Ronald Reagan International Trade Building, a debate is underway about how to tell the story of the EPA's history and mission. A miniature museum that began as a pet project of former EPA administrator Gina McCarthy has come under scrutiny. It features the agency's work over 4½ decades, with exhibit topics such as regulating carbon dioxide emissions and the Paris climate accord. The Obama administration championed such efforts, but President Trump's policies are at odds with them. Environmental Protection Agency Administrator Scott Pruitt addressed the Conservative Political Action Conference on Feb. 25 in Oxon Hill, Md. Now the museum, which opened just days before President Barack Obama left office, is being reworked to reflect the priorities of the Trump administration, an effort that probably will mean erasing part of the agency's history. Unlike other stark changes that have taken place at the EPA since Trump took office, the museum overhaul has not been primarily driven by political appointees. Rather, some of the same career staff members who worked on the exhibits under the Obama administration informed Trump appointees about the museum and the fact that parts of it were not in line with their vision. "I wanted to make sure that they knew it existed," said Nancy Grantham, a career public affairs employee at EPA, who has toured the exhibit with at least one Trump official. "That's just how I operate. I don't like to be surprised, and I assume others don't like to be, either." 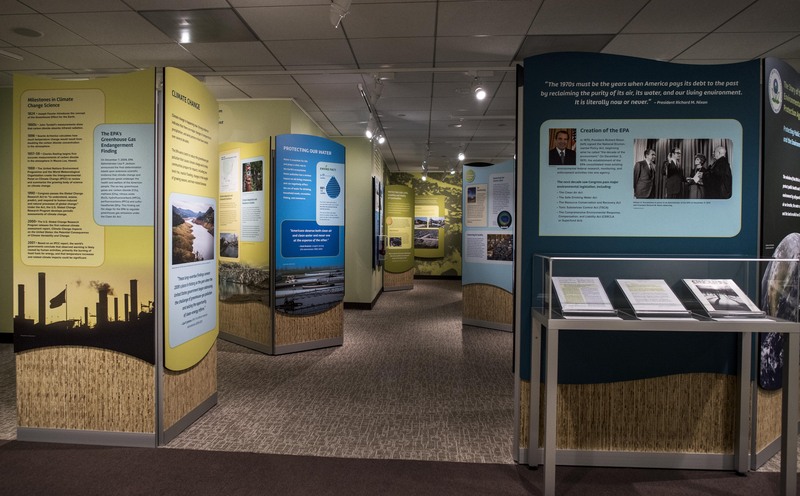 Most people outside the agency aren't even aware of the one-room exhibit just outside the entrance to the EPA Credit Union, which cost more than $300,000 to assemble and is open to the public free each weekday. McCarthy cut the ribbon with a giant pair of scissors Jan. 17, joined by a handful of former and current EPA officials and staff members. There is no question that parts of the museum reflect an Obama administration-centric narrative. It includes a panel dedicated to the 2009 "endangerment finding," in which then-EPA Administrator Lisa Jackson concluded that the agency was legally obligated to control greenhouse gas emissions linked to climate change because they threatened public health. A separate panel features a Dr. Seuss cartoon-themed poster with the message "Join the Lorax and Help Protect the Earth From Global Warming." The Paris agreement, in which nearly 200 nations pledged in December 2015 to curb their carbon output, also has a display panel, which notes that the "EPA is leading global efforts to address climate change." In June, Trump announced plans to withdraw from the agreement. The Clean Power Plan, Obama's signature effort to regulate carbon emissions and combat climate change, also is prominently displayed. "The CPP shows the world that the United States is committed to address climate change," the exhibit reads. Trump signed an executive order in March ordering his deputies to scrap the Clean Power Plan. 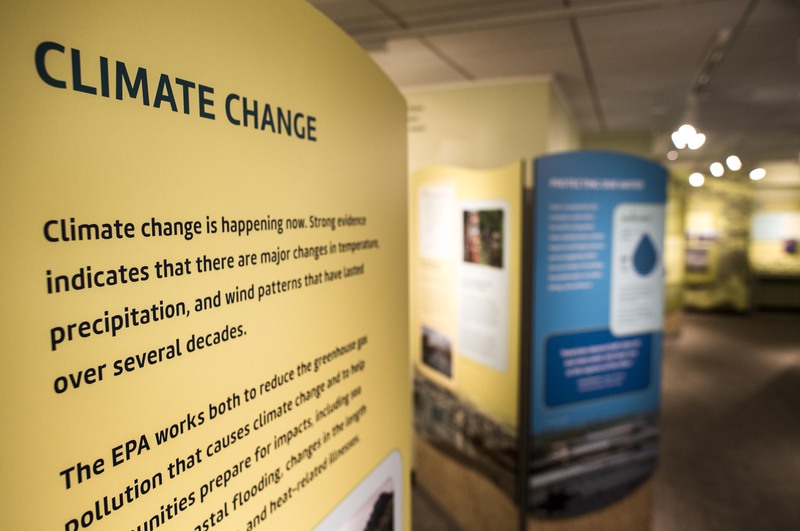 On a tour of the exhibit Thursday, a career official said that these climate displays are slated to be removed, adding that the agency may add a display of coal to the museum. Grantham acknowledged that the climate panels probably will be altered and possibly shelved, although she stressed that no final decisions had been made. "It should be no surprise that there may be changes," she said. She also said there is interest in beefing up sections of the museum that are priorities for the new administration, such as the Superfund program and a bipartisan 2016 law regulating new and existing chemicals that some of Pruitt's deputies helped write. She said the administration also may add examples of EPA staff members working on agriculture to a section focused on agency employees in the field. Grantham said Gorsuch will be added to the exhibit. The EPA museum began as the brainchild of McCarthy, who visited pollution-themed museums in Japan a year ago. Meeting with other environmental ministers from G-7 nations in Toyama, she toured the prefecture's Itai-itai Disease Museum, which is focused on a pollution-related illness that began in the area a century ago. Back in Washington, staff members set about making her vision a reality, with the goal of having it up and running before the Obama administration left office. Albert Stanley "Stan" Meiburg, who served as the EPA's acting deputy administrator at the end of Obama's second term and worked at the agency for nearly 40 years, said he was struck by the fact that other agencies ranging from the Energy Department to the Centers for Disease Control and Prevention had exhibits on-site that told their stories. "EPA had nothing," he recalled. "Nothing!" McCarthy "gave us the impetus" to do the exhibit, Meiburg said, although she did not oversee its development. "We thought, 'Now's the opportunity to do it, and to do it in the way that told the history of the agency,' " he said, noting that the EPA had that space under lease and "could modify it at very little cost." Meiburg said "the focus of it was the story of the agency" and "it was not something driven by a particular agenda." But he added, "We wanted to try to get this opened on Gina's watch." After identifying a space they could use for the museum, EPA employees contracted with the Smithsonian for advice on gathering artifacts and setting up exhibits. They also contacted the EPA Alumni Association. That group shared a 50-page document it had put together, titled "50 years of environmental progress," according to Phyllis Flaherty, an alumni association board member who worked at the EPA from 1976 to 2011. She said the document provided a sort of outline for what to include in the exhibit. The group also contributed a video for an exhibit about the EPA's role in the anthrax episode on Capitol Hill in 2001, as well as historical photos and the text of oral history interviews they had done. Linda St. Thomas, a spokeswoman for the Smithsonian, said the institution prepared the elements of the exhibit, such as the display panels, but had no input on its underlying content. Christopher Sellers, an environmental historian at Stony Brook University who has visited the exhibit, questioned in an interview why the federal government would want to alter it so soon. "It gives a good sense of what EPA has done over the last 40 years of its existence," he said. "It really explains what's at stake in having an agency like the EPA and having environmental laws to begin with." It's unclear how much taxpayer money, if any, it will take to overhaul the EPA museum to reflect the views of the Trump administration. Grantham said $45,000 remains in the agency's contract with the Smithsonian, but the costs would depend in part on how many changes ultimately get made. The money must be committed by Sept. 30, because it does not carry over to the new fiscal year, which will start Oct. 1. Related: Neil Gorsuch’s mother once ran the EPA. It didn’t go well.